Disclaimer: The nice people over at Ignite Naturals sent me a starter packet to try out the product. I was not otherwise compensated for this review, and all opinions are my own. 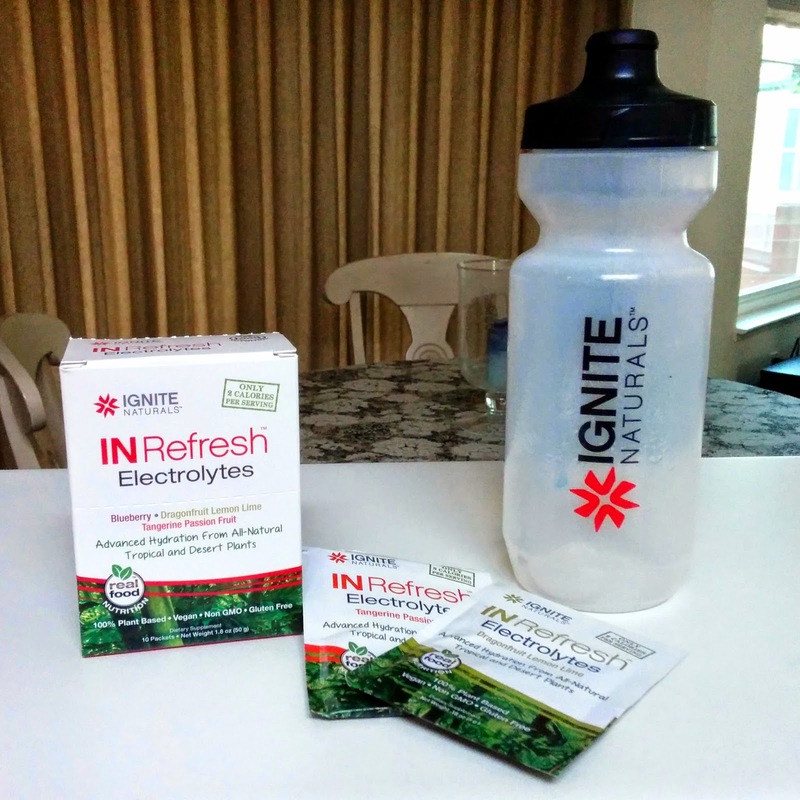 Ignite Naturals is a company focused on sports nutrition via natural ingredients, and they sent me three sample flavors of their IN Refresh electrolytes product to try out and review. The product is 100% plant-based, vegan, and gluten free, and it can be purchased as single-serving packets or a large 30-serving canister of powder. Thanks to Ignite Naturals for the starter kit. 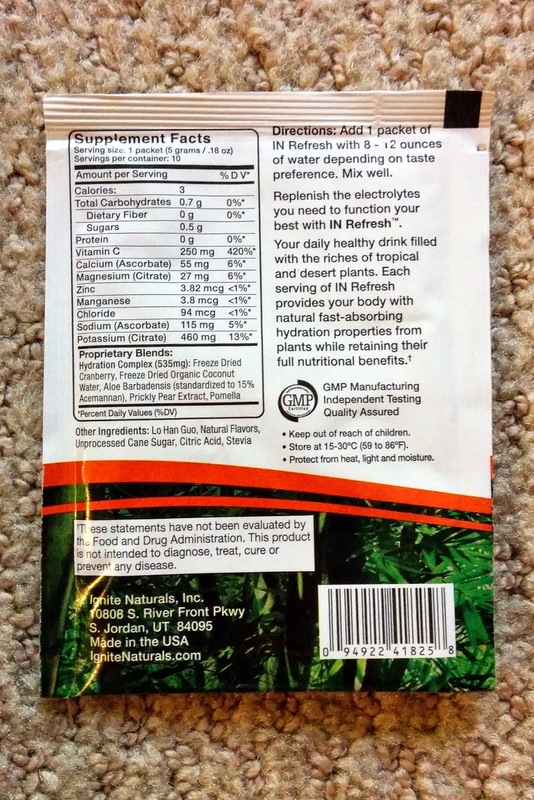 My first impression of Ignite Naturals IN Refresh is that I like knowing it's an all plant-based powder with many vitamins and minerals the body can use. According to the ingredients, it's sweetened with cane sugar and Stevia. I added one packet to about 12 ounces of water, the most recommended on the back of the packet (suggests 8-12 oz depending on flavor preferences.) I also tried adding a packet to 16 oz of water, the whole bottle size, which also seemed fine to me. The bottle needs shaken quite a bit to get the powder to dissolve and it never completely dissolves from my experience. I imagine this is due to using real minerals and freeze dried fruits, which are likely not all completely water-soluble; it doesn't seem to effect the flavor or texture in a negative way. With regards to the flavors, I found all of the ones I tried (Dragon Fruit Lemon Lime, Blueberry, and Tangerine Passion Fruit) to be very strong. The Dragonfruit Lemon Lime is pretty good but noticeably sour to me, and the Tangerine Passion Fruit made me feel like I was drinking a creamsicle. I'm generally not a fan of blueberry or strong berry flavors, so it's hard for me to judge that one. My husband, who does enjoy blueberry flavors, found it to be more generic-berry flavored than blueberry flavored. My overall impression of IN Refresh is that it's a great all natural product for hydration, although the flavors might be too intense for me on an everyday basis. If you are someone who loves intense fruit flavors, I'd highly recommend checking this hydration product out.